Eddie Jones has been given a boost ahead of the Six Nations, with both players returning for their clubs this weekend. Vunipola has been out for the last three months. BILLY VUNIPOLA AND Joe Launchbury are ready to return for their respective clubs following lengthy injury lay-offs in a boost to England coach Eddie Jones’ Six Nations preparations. England were depleted by injuries during the recent November Tests, with number eight Vunipola missing due to a fractured arm and Launchbury sidelined after undergoing knee surgery. However, Vunipola will make his first appearance in almost three months when Saracens face Sale Sharks in the Premiership on Friday while Launchbury is back for Wasps’ clash against Northampton Saints two days later. 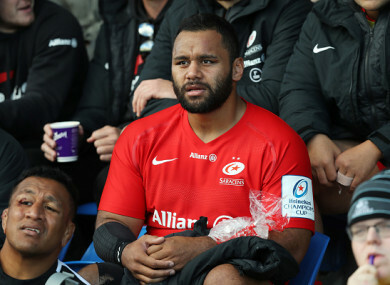 Vunipola fractured his arm in early October and has been blighted by injuries in recent years having started just three internationals since November 2016. Lock Launchbury had been a more regular fixture for his country but the 54-cap international had to go under the knife after injuring his knee in September. England begin their Six Nations campaign against defending champions Ireland in Dublin on 2 February. Email “England duo Vunipola and Launchbury to make long-awaited injury returns”. Feedback on “England duo Vunipola and Launchbury to make long-awaited injury returns”.